Reality check time. My baby is going to be a kindergarten kid in a few months. Soon, JSL will no long be in preschool in the place that we know and love. He will venture off into an entire new world filled with learning and many more firsts. Before I rush us past this first year, I am going to cherish the time we still have in his nursery school. On a day that we went for a meeting with the school district about JSL’s amazing speech progress, we had wonderful box of goodies sent home. These were items that JSL had made during the school year in his classroom. Each child presented their families with an amazing Shabbat Box. As fantastic as it looks on the outside, it was even more impressive inside. Check out all of the items that were within the gorgeous Shabbat Box. So what are all of the items you ask? 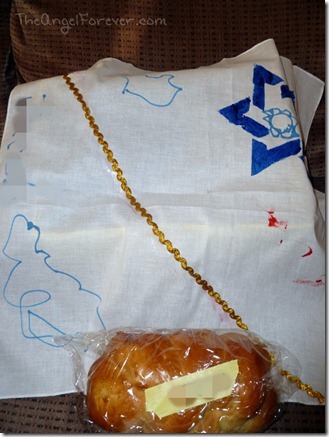 Well, let’s take a tour to see all of the JSL made Shabbat items that his teachers helped to make. This week, the kids spent time making challah dough, learning to braid them, and baking mini challahs to bring home. These were perfect to have along with the challah covers that they also designed. Of course, when preparing for Shabbat there must be something to drink wine –er grape juice out of. 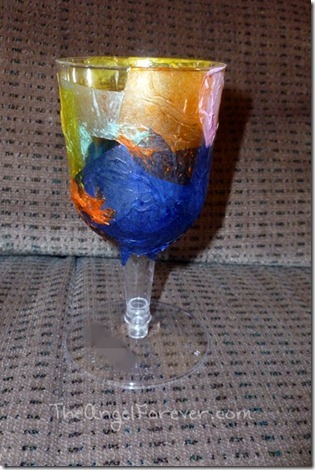 This is the colorful kiddush cup that JSL created. 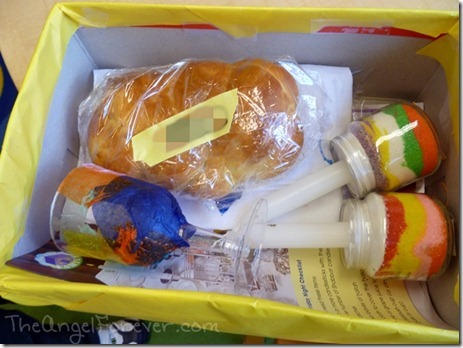 There was one item that was breakable in the Shabbat Box. 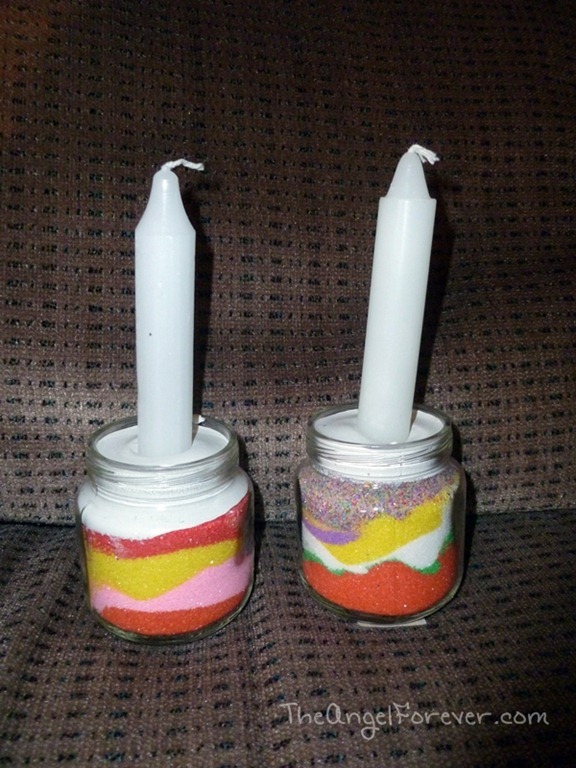 The kids made beautiful sand art Shabbat candle stick holders. These are so pretty thanks to the different color sand varieties that they had to pick from. 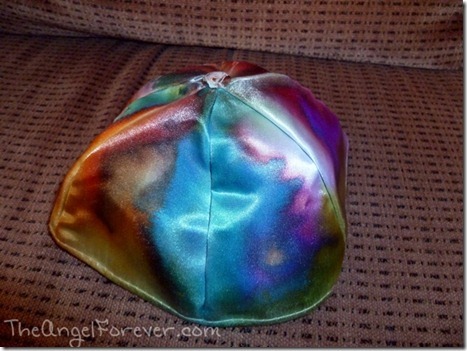 The item that I think JSL will use a lot is the kippah that he made. I am sure he will be able to wear it to holidays and also use it for Shabbat. JSL told me that they painted them. Love the tie dye effect and how original his came out. The last things included were some educational items. 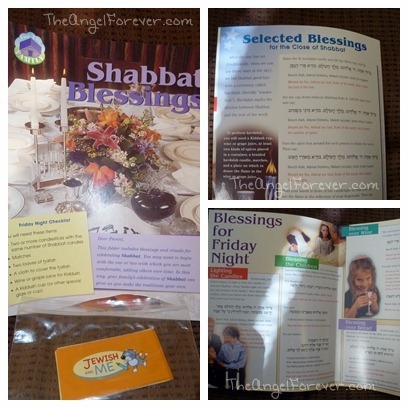 There was a pamphlet with Shabbat blessings for Friday night and ending on Saturday evening. JSL was especially excited about the Shabbat matching game that he insists we play soon. 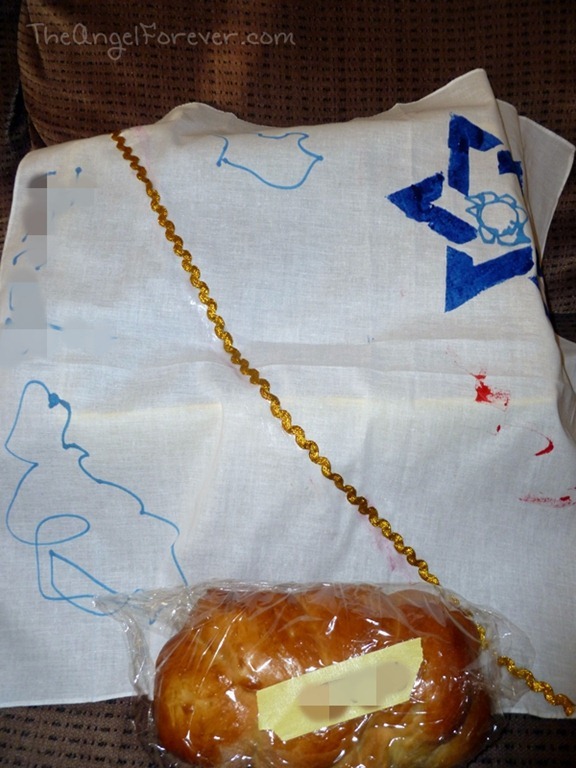 Thanks to making these special items to use for Shabbat, they mean even more to JSL. I know that he will always remember his time in preschool thanks to the memories that his fantastic teachers have provided for him. P.S. The kids also made another item that came home last week. More on the Tzedakah box coming soon! Could you please tell me what is keeping the sand in the glass jars when on their side? I think I see some kind of plastic lid. Probably glue. My son made a similar project with a fake flower and it was sealed with glue. Where can I get the pamphlet for the blessings? What a wonderful idea! Can’t wait to do this for my class. 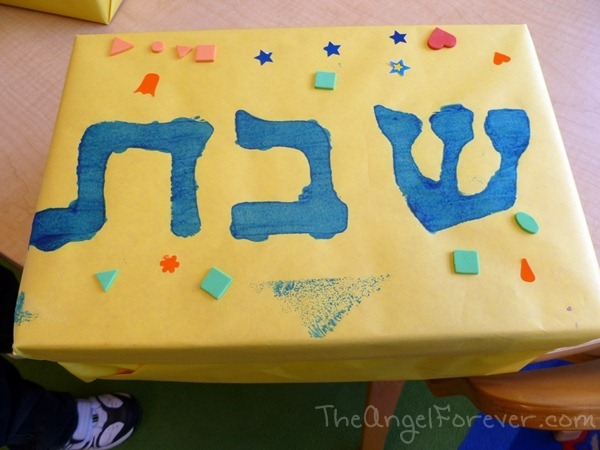 For the kiddush cup, do you use plain glue, or do you mix with water when sticking the tissue paper? 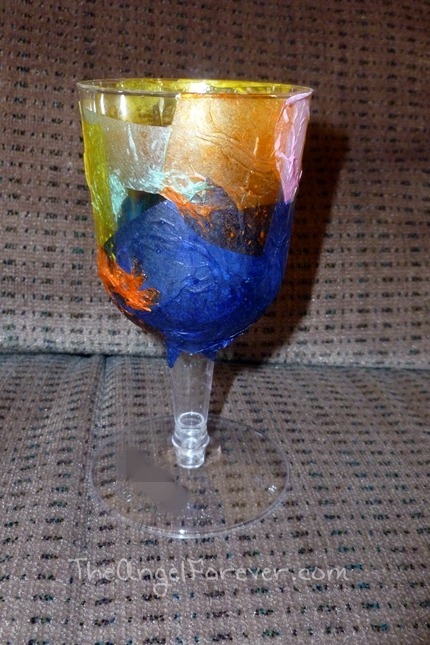 Do you put something on top to make sure the tissue paper stays, like modge podge?